WORDS OF REASSURANCE. Once upon a time, Shoya was terribly cruel to Shoko, his elementary school classmate who couldn’t hear. To make up for his past sins, Shoya has devoted himself to repaying the debt of happiness he owes. So when Shoko faces a romantic setback, Shoya assembles some familiar faces from their past for a trip to the amusement park that may just change things for Shoya, too. I am sitting here trying to write something and all I can think about is how emotional this particular volume made me feel. I think sometimes when reading books with only text, yes we can use our imagination to help form images in our heads but I think sometimes we have the ability to turn that off. However, when given both text and pictures, this adds a whole other element to the ball game. Yoshitoki Oima definitely made me feel some strong emotions with this one. We seemed to be left out on a little rough patch with the last volume and Shoya has come so far to not stop in earning Shoko's trust and friendship back now. Without having to come to this, Shoya decides to organize a trip with some old school people and take an adventure to the carnival. However, when an unexpected death happens, will the carnival plans fall through? There is this growing love and adoration I am having for both Shoya and Shoko as I continue making my way through each of these volumes. As a whole they have both grown, especially Shoya, but Shoko, I feel, has come out of her shell of uncertainty and has developed much more of a strong stature around people. Am I rooting for them as a couple, I am not sure. 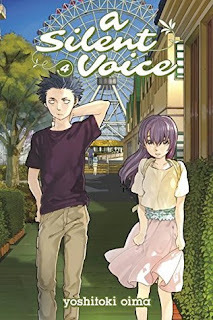 What this volume does have though is a lot more delving into the past relationships as friends as well as the drama that hasn't yet been resolved. However, we are seeing the past of not just the main characters but Shoko's mom and how she became the way she is today. Seeing a vulnerability that we didn't think existed shows how much a person who can be first described as strong-headed and/or even bitter is actually struggling on the inside. I have no others words than to say that all must read this manga series. It is a light read that delivers powerful topics that is necessary for all readers. 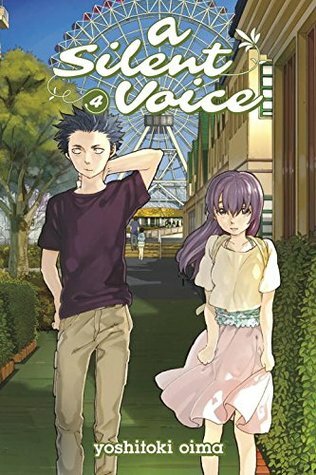 A Silent Voice is easily the best manga I have read in a while. Stellar piece of literature! I give this manga 5 souls!